Here's a big shout-out to my MIL for getting me these Hunters for Christmas. I have a green pair as well, but I have worn these black boots for most of the snowy season. She's the same lady who is responsible for Hope's cat shelf, so you can imagine how cool she is. Very. I've been trying to find that weird balance of taking it easy because I caught a blasted cold, and keeping up with all the responsibilities because I'm a busy lady… it's tricky. My normal 2:00am bedtime has switched to an 11:00pm bedtime, and I'm not quite as quick on my feet as I'd like to be. This cold won't last forever (fingers crossed) and pretty soon I'll be back to my regular self. Right? Riiiiiight??? I hope your week is illness free and absolutely wonderful! 2am bedtime?! What time do you wake up? I have to have at least 7 hours of sleep (and no more than 8). I'm trying to be a better "morning person". I can feel myself coming down with something as I type this. Grrr. I love the stockings in this outfit. I love those tights. I am starting to view plaid is a neutral. 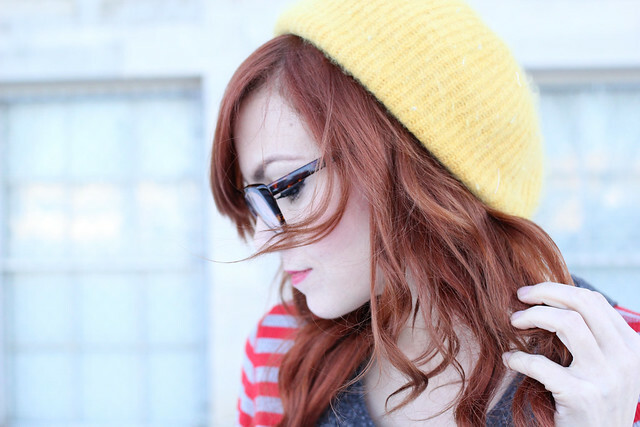 It is just so classic and pairs with everything (or at least in my closet). your mil is the coolest! and that jumper is just too cute! I love the mixture of stripes and plaid! Love the outfit and especially the glasses! Feel better soon! You have the coolest style. Ever. Fabulous! And you do not look like you have a cold, you look fresh as a daisy! How do you do it?? That dress is ADORABLE! Also, I'm loving those plaid tights!! glad I'm not the only one with a 2am bedtime! Once the baby is asleep is when I get most of my work done so I'm definitely a night owl out of necessity. cutest dress. i love the tights and shirt together. A 2:00 a.m. bed time??? How do you do it? If I don't have 9 hours of sleep I'm ridiculously grumpy. Cute outfit and I hope you feel better soon! Oh that jumper is too cute for words! Those pockets! Also, I'm super impressed with your late bedtime. If I go to bed at 11 I'm staying up late! The shirt and jumper match so well that should go together as a dress, you look adorable! Hope you completely recover soon from that cold. I love your Hunters, I really want a pair. Great post. I love your dress! 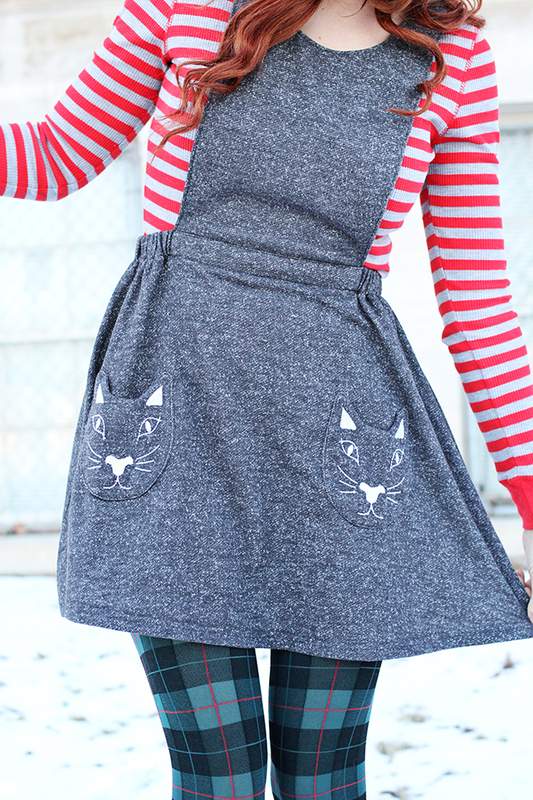 The cat pockets are adorable! That dress is just so adorable! And those tights are so fun! you seem to have such a great mother in law! I suddenly don't feel as crazy for having a 2am bedtime. haha. 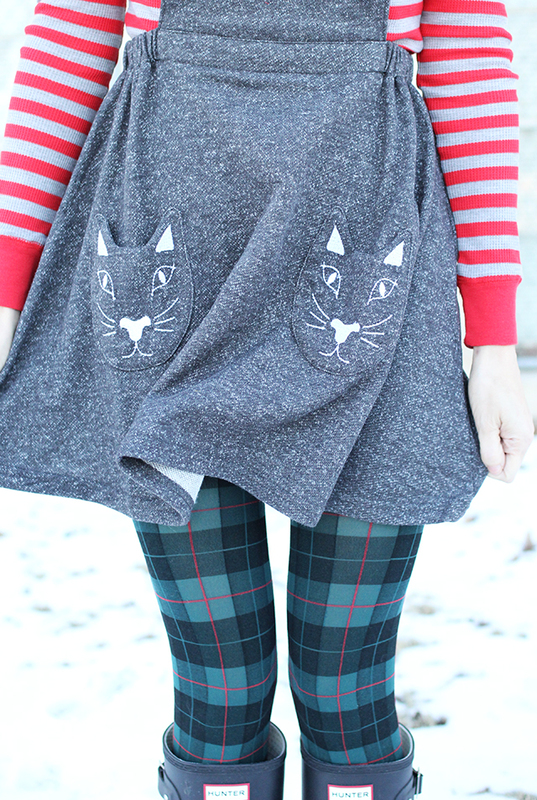 I love this outfit - especially the cat pockets. I need something with cat pockets ASAP!